After a day wrangling with code - whoever thinks a modern artist can be a luddite has not seen my average day - that included various webby upgrades, module installs, sql patches, cron jobs and other geekery, some of which went smoothly and some that, ah, didn't, I am back in the studio and thought perhaps you'd like a wee tour? To begin the tour, I work in a spare bedroom that was agreed would be my art studio I commandeered. My works are currently quite a managable size, so there is no need for a big space. I've learned how to paint without toxic fumes so there is also no need for a super extraction exhaust setup. This means I am able to work at home with my dog and destructopuppy and can take regular breaks out in the vege garden or whip up food when I feel hungry. I really enjoy the flexibility. First off, it's a wonderful freedom to have all the books that inspire me to hand. And the filing too. 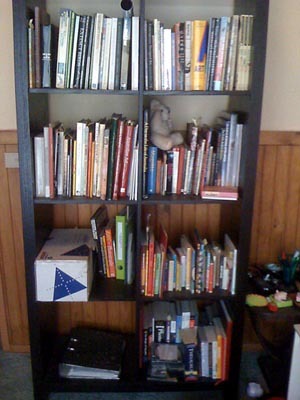 This here is the office section of my studio, but you figured that out. Yes, this is a bit unusual. I find chairs really uncomfortable. 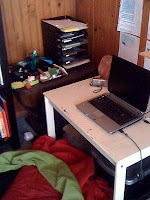 You should see the wriggling and perching and contortions I get into in an effort to get comfy on a chair. But sitting on the floor on a cushion, Japanese style? I can focus without moving for hours at a time. I pride myself on figuring out lateral thinking solutions that are dead easy to implement. These are my drying racks. They are wire clothes airers turned into shelves. 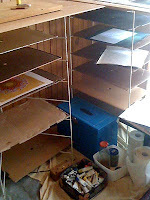 The blue box is a metal fire proof box for storing the oil paints and mediums. You know, just in case destructopuppy figures out matches. And finally we have where the magic painting happens. If it looks pretty basic, let me walk you through the whys and maybe you'll see how it fits me so well. It's a compact setup that allows everything I need to be to hand. 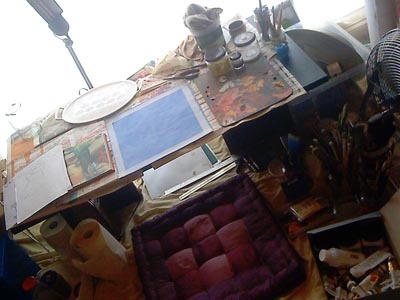 The painting area is directly in front of a big window that allows the most light where I need it - on the paintings. The white curtain makes the light soft and filtered and is specifically white so there is no colour cast onto the work area. There is a super bright & clean coloured work lamp on an adjustable arm which I find indispensable. You might be able to see a few more sideways solutions if you look carefully. Forget fancy brush holders - huge instant coffee jars are perfect! And did you spot the giant plastic serving tray used as a palette for acrylics and the fridge egg holder used as a palette for inks and watercolour (icecube trays also work well)? There you have it. An artist's studio revealed! So artists, what's your studio look like? Pop a link to pix in the comments. I'm sure every creativity studio is unique. I'm not much into chairs either. I like your sitting Japanese style idea! your cookbook art combination ideas sound just wonderful :) love it!